Twelve chapters that respond to these objectives were solicited from participants of the 2008 Thomas R. Watson Conference on Rhetoric and Composition and were reviewed by the book’s editors. The book includes a foreword by N. Katherine Hayles and responses to the themes above written by Marilyn Cooper, Paul Prior, Diana George, and Andrea Lunsford. 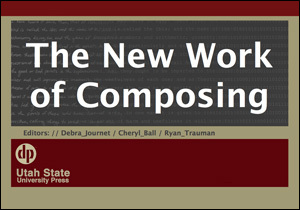 Authors include established scholars in digital writing studies and digital humanities, as well as new voices. Journet, Debra, Cheryl Ball, and Ryan Trauman, Eds. The New Work of Composing. Logan, UT: Computers and Composition Digital P/Utah State UP, 2012. Web. Copyright © 2012 Debra Journet, Cheryl Ball, Ryan Trauman, and Utah State University Press/Computers and Composition Digital Press. Some rights reserved.